I love this look on Kate, featuring a Zara blazer and Gap shirt! Photo by Bauer Griffin. 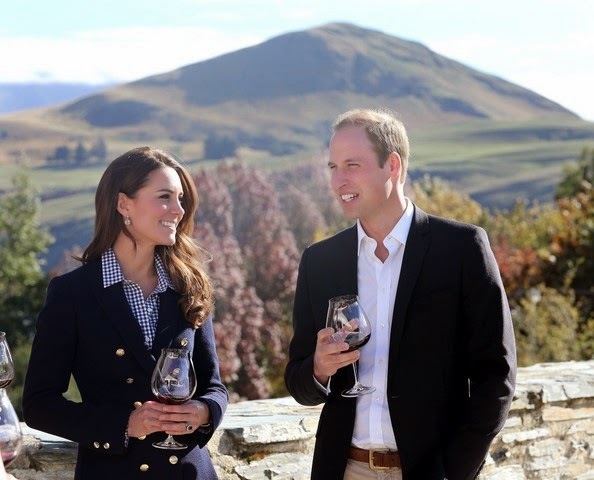 Kate (or Catherine, the Duchess of Cambridge, if you prefer) is knocking it out of the park Down Under. In the middle of her three-week Royal Tour of New Zealand and Australia with her husband, Prince William, and their son, the adorable Prince George, Kate has been photographed wearing some very stylish ensembles and I have been loving most of her choices! Kate in Manly Beach with lifeguards. I love the eyelet dress! Photo by Bauer Griffin. What I think Kate is doing particularly well is going from high-end, or even bespoke, coats and dresses from Catherine Walker, Erdem, and Alexander McQueen one day, to very affordable pieces from Zara, Diane von Furstenberg, and Gap the next! Her accessories are a good mix of the high and low too—Ray-Ban Wayfarers? Check. Cartier Ballon Bleu watch? Check. Borrowed 1953 diamond and platinum fern leaf brooch from the Queen? Check, check, and check. This gal’s got it all! The two terrific blogs that have kept me up to date on what Kate is wearing on this royal tour, with great details and links to where everything can be purchased, are What Kate Wore and Duchess Kate. I highly recommend both! Great detail shot of Kate in a lovely eyelet dress by Zimmermann. Photo by Bauer Griffin. Kate with an LK Bennett clutch and Cartier watch. Photo by James Whatling/Splash News. 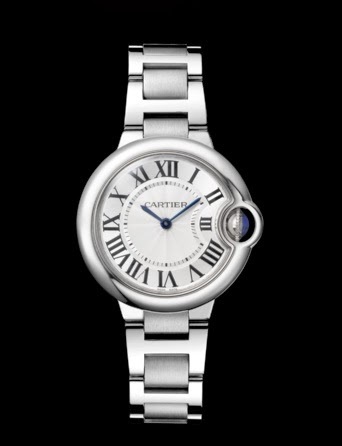 Ballon Bleu de Cartier watch, 33mm. In Ray-Bans, skinny jeans, and sneakers! Photo by Bauer Griffin. In a great DVF dress and I love the wedges! Photo by Getty Images. I’ve read that Kate is possibly being advised in her recent style choices by a close friend of hers, but whether it’s her friend, her sister Pippa (which seems possible), or she’s even going it alone, I think Kate is making all the right moves. In Catherine Walker. Photo by Chris Jackson/Getty Images AsiaPac. In case you were wondering, I turned up this information on her gorgeous fern leaf brooch Kate wore when coming off the plane in New Zealand: It’s from 1953, made of diamonds and platinum, and the fern leaf is an important New Zealand emblem. The brooch was a Christmas gift to Queen Elizabeth II from the women of Auckland during the Commonwealth Tour of 1953-4. William carries Kate’s Longchamp bag. Love it! Photo from express.co.uk. Do not get me started on a man who will carry his wife’s bag. What a prince! I love that the bag he holds for his wife is the simple and ever-popular Longchamp Le Pliage tote in black nylon. What have you thought of Kate’s style choices while on tour? I am also totally loving her style Jill! She always looks fantastic and cannot see her putting a foot wrong when it comes to fashion. Thank you Jill for this great summary. So far she's got everything right, she looks comfortable, appropriate and attractive in every setting on this tour including carrying a teething baby so every credit to her and whomever is advising her. I personally think she has friends who are bound to give their opinion but most of it must be her own research and common sense. Afterall, she's always had the same style from when she was at uni and whilst some labelled her boring, I'm sure they been won over by now. She executes good taste and timeless style in a very discreet way. She is such a fabulous role model for young women! I love to show my high school girls what she is wearing...chic, stylish, fun, and modest...she rocks it in every way! I cannot tell you how much I appreciate her. I didn't think anyone would capture our attention and adoration the way Diana did...but a Kate is doing a great job of it. Her hi low mix is refreshing and fun!! She really is a breath of fresh air. I love that she is mixing up her outfits....nice touch too to wear that fern brooch. I wonder if she is mixing if up so that she can be less aristocratic and more approachable. She is lovely and seems to be enjoying the tour. Ditto to all above. As well, I think her personality comes through a bit. Confident, considerate, and classic. I don't really follow her, but she seems lovely. Really classic style--perfect Princess :) He seems like a good Prince, too. Although, I would like to add I don't believe in 'royalty'. I think she does a good job of looking nice without turning herself into a fashion show. If you want people to perceive you as a real person you should act like a real person and that extends to wardrobe. She doesn't need a new outfit for every outing, she doesn't always wear custom clothing, in short she's halfway normal.